Sound out words with the long vowels A, E, I, O and U. Sound out words with the Book 1 consonants, plus W, P, K, J and Z. Sound out words with ST, SM, DR, CK, SH, SW, ING, SL, OR, BL, SP and TR. Learn the suffixes "es," "ed" and "ing." Practice new words and sentences with the included writing worksheets. 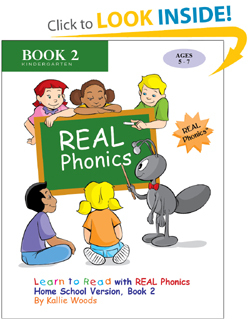 REAL Phonics reading lesson plans guide you every step of the way with Teacher's Notes included on each page, so you and your child can use the same book together. No prep time is required, just open the book and begin teaching!